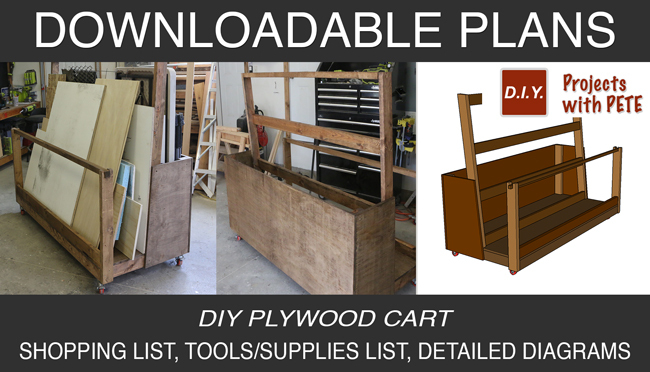 The Plywood Cart is a must have in any workshop where you need to store materials but have limited space. 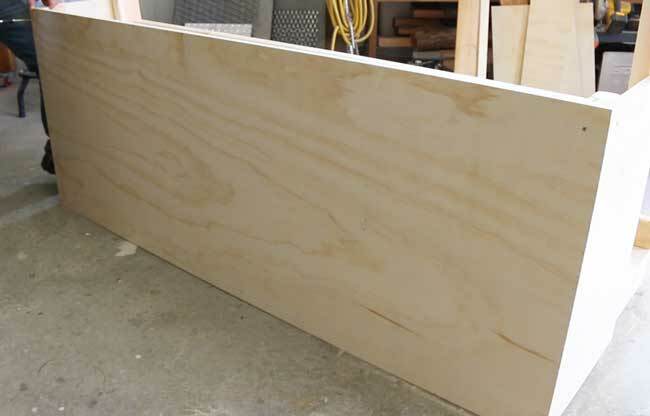 Get your plywood and other materials off of the floor and out of ﻿the﻿ way! 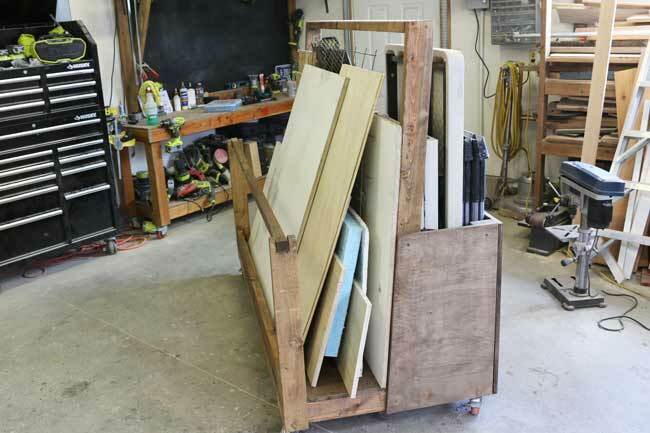 The cart can hold full 4x8 sheets of plywood as well as other sheet materials. 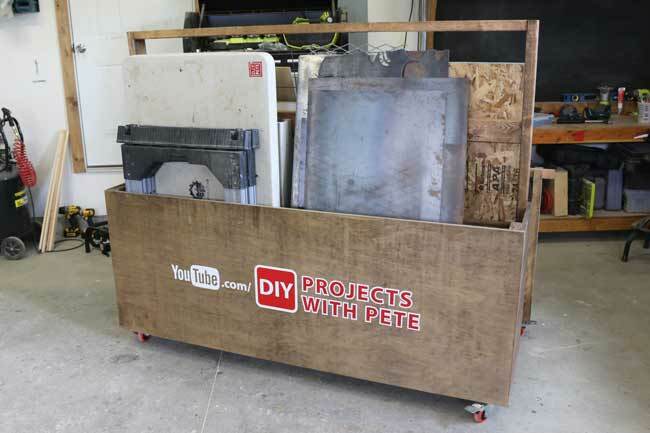 It also has a storage bin in the back that can be left open for large items or divided up to custom fit smaller materials or tools. 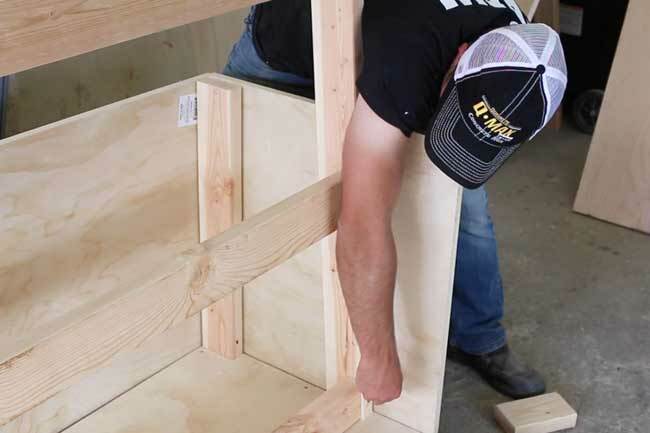 The removable railing makes it easy to load materials from the front and to access materials that are difficult to reach at the back of the pile. Cut the boards for the base frame. They are all cut from 2x4's. There will be 5 cross supports and two long boards. 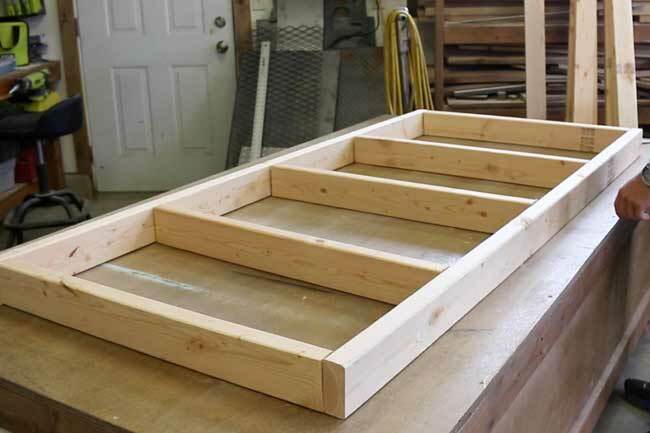 Once all of that is cut, lay the frame out on a flat table and assemble. Now that the frame is assembled, we need to add the plywood base. Cut the plywood to size and attach it to perimeter of frame as well as to the cross supports. Now flip the frame and add the extra blocks for wheel support. 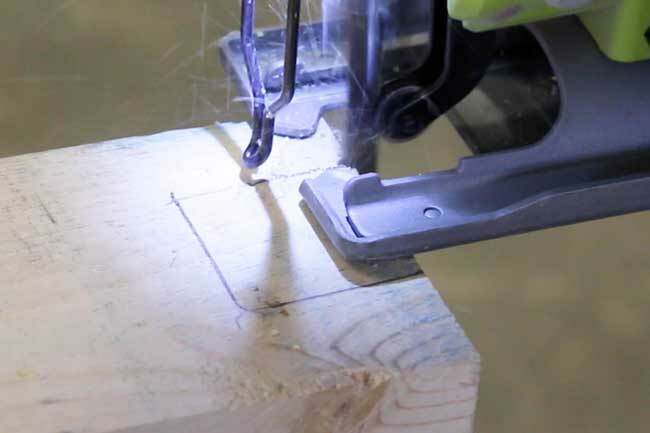 Cut out two boards with a 5 degree angle on both ends. 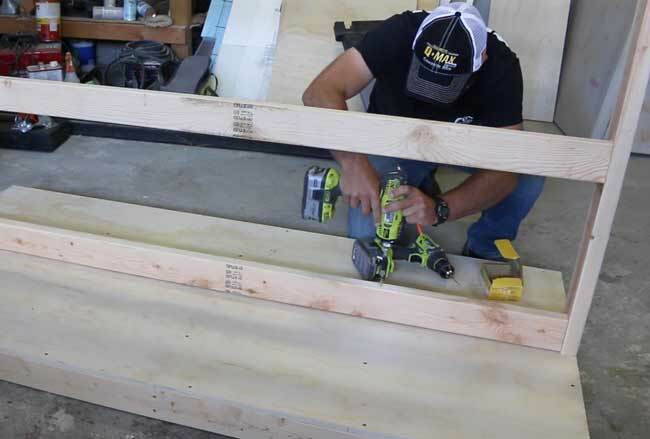 Then cut out 4 long boards with a straight cut, these will be the cross supports.​ Attach them at an even spacing flat to where the plywood will rest. With the plywood rest assembled, attach it to the base frame. 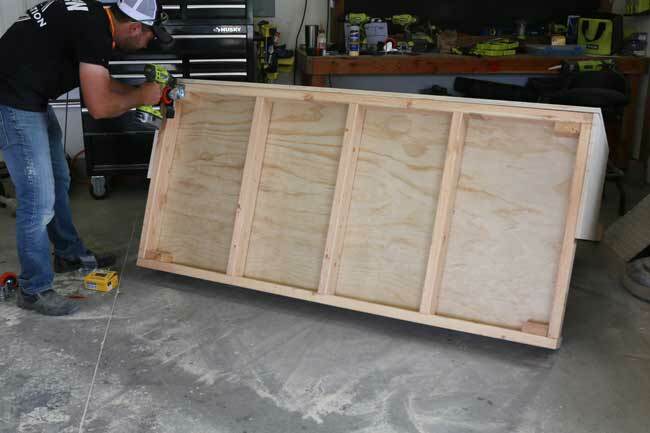 Cut and attach two 2x4's that will be the outside corners of the bin. Once that is done, scribe the size for the sides, then cut and attach them. Finally, add the longer back board and complete the bin​. 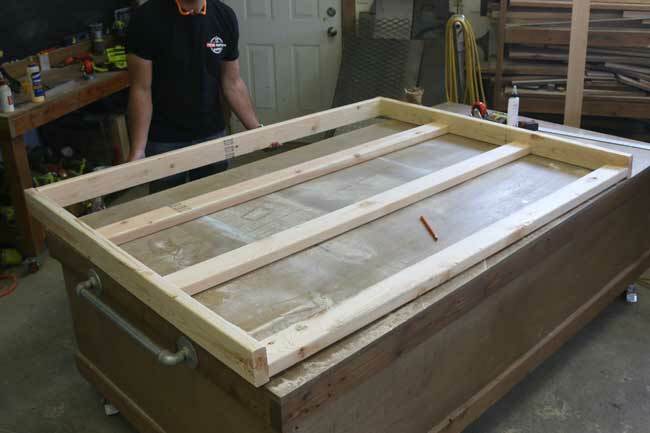 ​Attach the 2x4 that will be the outer lip and keep the material from sliding out. 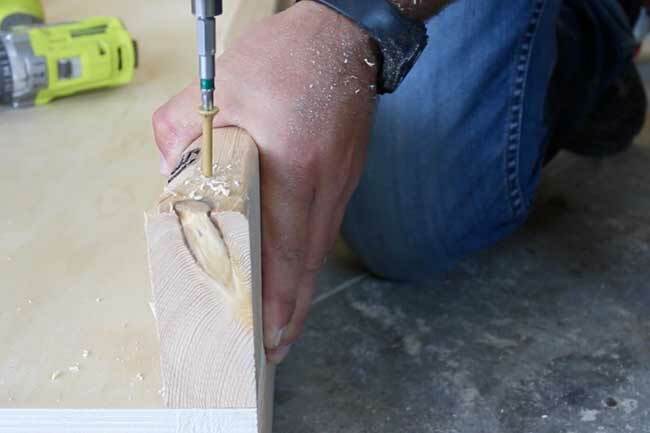 For the railing, cut a square slot out of the 2x4 supports that ​will fit the railing bar comfortably but tightly. Attach those supports and slot in the railing. Flip the cart onto its side and attach the wheels. Be sure to use the extra support pieces that we added at the beginning. Also, add a washer around each screw so that the wheels are held tightly in place. 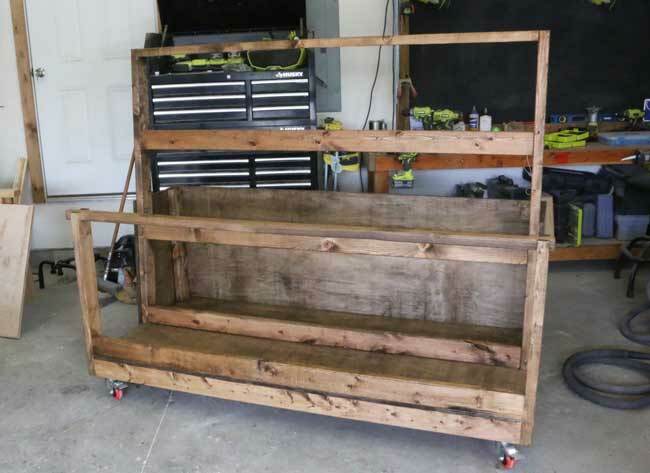 Once the wheels are all attached​, flip the cart back over.